From 2007 to 2011, high-level plans for the Lewis Farms Facility and Park were created from the vision outlined in the Recreation Facility Master Plan and Medium Term Recreation Facility and Sports Field Plan. The decision to move forward with schematic design meant we needed to check in with the public and stakeholders to find out whether we were on track with the major activities identified for the facility and park and whether the program needed to be revised. This assessment was completed from April - July 2015 as part of our Sharing Ideas consultation. The Sharing Ideas consultation session, which included an online survey and an open house, focused on hearing directly from citizens and future users about the types of activities they would like to do in the facility; their thoughts on the importance of these activities; and their vision for the facility and park. We produced What We Did, which provided basic facts and stats of who participated and how. Now we’d like to dive deeper and share the results with you about what we heard. We heard from you about the activities you want for the facility and park, your vision for the park, and we’ve used this information to update the functional program that will feed into the next phases of schematic design. A number of factors influenced our decisions to change or update the program, of which your feedback was one part. The changes to the program were made by doing a needs assessment, analysis and decision-making process. These decisions are highlighted in the What We Heard report in more detail. We have also created a What You Said document which details all the feedback received from the public for the Sharing Ideas consultation. 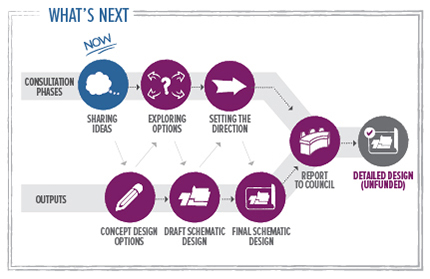 Your next opportunity to get involved is during the Exploring Options phase in early 2016, focusing on a review of the concept design options. The information collected in this phase will be used to create a draft schematic design. Our next step is to provide all this information to a consultant to develop concept design options, which will provide the next layer of details to the high level diagram. This includes things like the size, shape and location of the facility, parking, sports fields, and pathways. Your next opportunity to get involved is at the Exploring Options phase in early 2016, focusing on a review of the concept design options. The information collected in this phase will be used to create a draft schematic design, which adds details such as the sizes and shapes of rooms, the locations of the doors and lighting, parking stalls, number of sports fields, and pathway size.